I was wondering when we were going to see something new from Festool, and not just a new version of one of their other products. Considering Festools popularity among woodworkers, I am surprised they do not make more woodworking tools. I have no idea how long it takes Festool to go from idea to working tool, and maybe I just expect too much from them. Like all Festool tools, they put dust collection right at the top of the list when they designed the EHL 65 E. You can connect this to any Festool dust collection system. One thing that I like right of the bat, is the ability to collect dust on either side of the planer. Its the little things that make me happy. 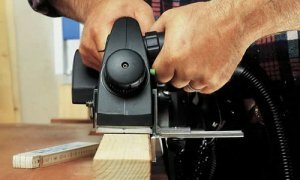 As always, Festool makes high quality tools that come at a price. I found the EHL 65 E for pre-order from Ace Tool for $390.00. Makita makes a planer that costs over $600 , and one at over $1700 , so you could be spending a lot more.